How to identify your child strengths and challenges, meet with teachers, and to effectively advocate for your child. Which reading approaches work for students with dyslexia, and which ones don’t, and why the “D” word is such a hot-button issue. How to turn obstacles into opportunities, stresses into successes, and how high tech can be a huge help. “The only mystery about dyslexia is why the Education Establishment treats it like one!”declares author Cheri Rae, who successfully led her dyslexic son from K through 12, founded the Santa Barbara Parent Resource Center, and has helped hundreds of children with dyslexia and their parents. 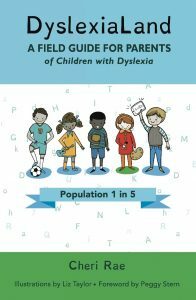 While other books take an academic approach and dwell on dyslexia as a disability, DyslexiaLand: A Field Guide for Parents of Children with Dyslexia provides a practical approach, focusing instead on the many talents and abilities of children with dyslexia and how parents can help them thrive in school, at home, and in the community. This guide helps parents save significant time and money by pinpointing the support a dyslexic child needs early on and avoiding larger costs—financial and emotional—that a family may incur if a child’s school struggles are not promptly identified and addressed. Complete with proven strategies, easy-to-follow directions and maps.